“I could eat this for lunch seven days a week,” said Steven, after tasting a forkful of last night’s dinner. High praise? Well, coming from a guy who is actually notorious for eating the same lunch every workday for nearly a month… maybe not. But I’ll take it. On any given day, I’ve got a couple recipe ideas buzzing around my brain. I toy with them, mull them over, research similar recipes. Sometimes I actually make them. Every so often, though, a wholly unplanned meal idea just pops, fully-formed, into my head. I don’t ignore impulses like those—I head straight to the kitchen to cook. Thus was born Monday night’s dinner. Tangy and abundantly flavorful, this dish is a winner. A zesty, creamy lemon-Dijon sauce is the perfect accompaniment for the more subdued flavors of broccoli and quinoa. This bowl is a surprisingly filling, fun-to-eat side dish that probably tastes just as good cold from the fridge as it did warm from the pot. You could add some baked tofu for some extra protein and to kick this into entree territory. Combine the quinoa and vegetable broth in a small saucepan on high heat. Once the broth boils, reduce heat to low and cook for 15-20 minutes, or until the quinoa has soaked up all the water and is light and fluffy. In the meantime, prepare the sauce. Vigorously whisk the wet ingredients together until emulsified, then add the spices to taste. (You could use a food processor or immersion blender, but this is such a small portion that you can easily whisk it by hand.) Place the finished sauce in the fridge. As the quinoa finishes cooking, chop the broccoli into small florets (if you haven’t already) and steam it lightly, for about five minutes. You want it to be not-quite fork tender; it should still have a little bite. I used a steamer pot, but you can use your favorite steaming method. 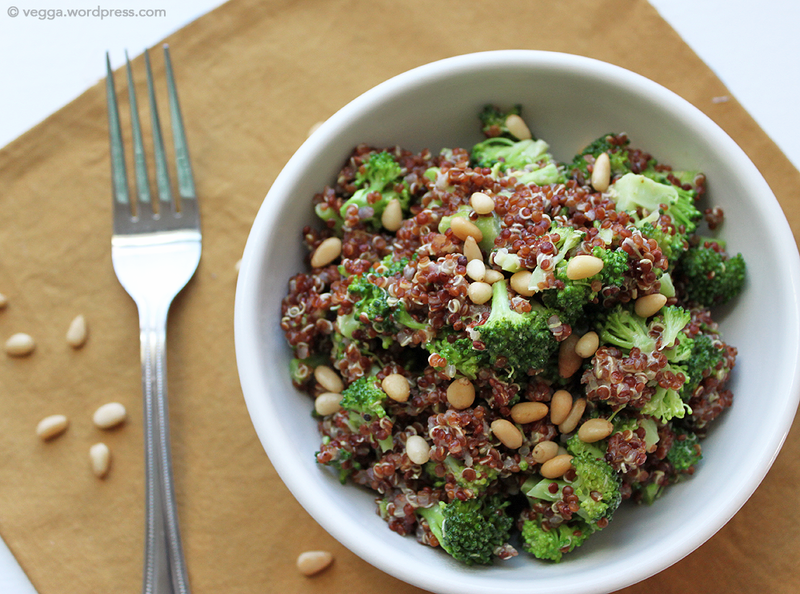 When the quinoa and broccoli are both done, mix them together in a large bowl. 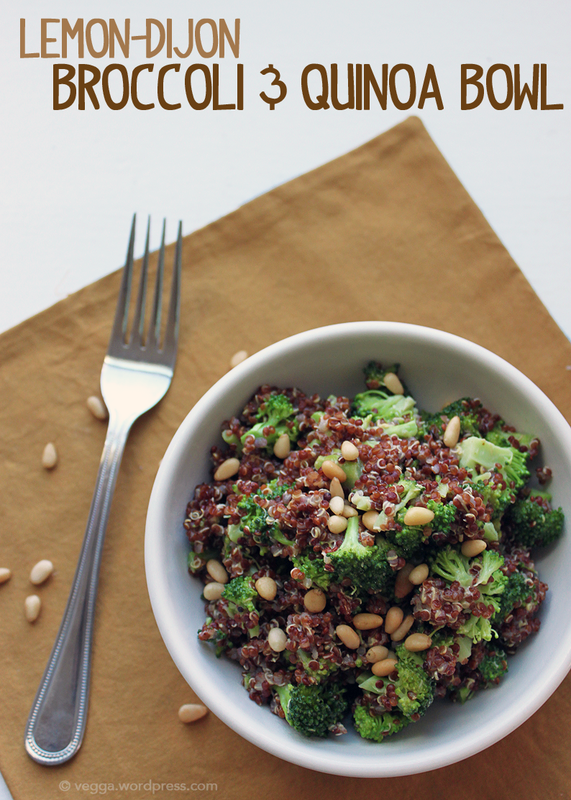 Remove the lemon-Dijon sauce from the fridge, shake it, and pour it over the quinoa-broccoli mixture. Let it sit for at least five minutes to absorb the flavors, top with pine nuts, and eat! Looks and sounds like a great lunch. It was — it was fantastic cold! I love food in bowls — especially when they contain broccoli and a delicious, lemony sauce! I would eat all my food in bowls if I could! I made the Lemon-Dijon Broccoli and Quinoa Bowl for dinner tonight. I doubled the mayo ( I like Just Mayo) and skipped the olive oil. This will be a regular dish at our house, next time I will bake some tofu and add it in. Thanks for a great recipe for a tasty satisfying meal. Good to know re: the mayo! And yeah, I agree — it’d be fantastic with tofu. I’m definitely doing that next time, or maybe some crumbled tempeh.